We hope you love everything you order from In Vogue Pets, but we get that sometimes things don’t work out! In Vogue Pets products come in a number of different sizes, so please check the individual product descriptions for measurements or by checking the size guides provided here. Please note that unfortunately we do NOT do any exchanges. If you purchase the wrong size, you will still need to do this Returns process and purchase the correct size on a separate order. In Vogue Pets will happily receive returns within 30 days of you receiving your order. If we’ve sent you the wrong item or your item is faulty/damaged we’ll happily cover the cost of return shipping. If you’ve changed your mind or purchased the wrong size, shipping will be at your own expense. All returned products must be unused, in their original undamaged packaging and contain no fur. Read below for more information. All returns must be sent back with a completed Returns Form & a copy of your invoice inside the parcel. Please allow 2-3 weeks from the time the item has been sent back to us, for all returns to be receipted and refunds to be issued. 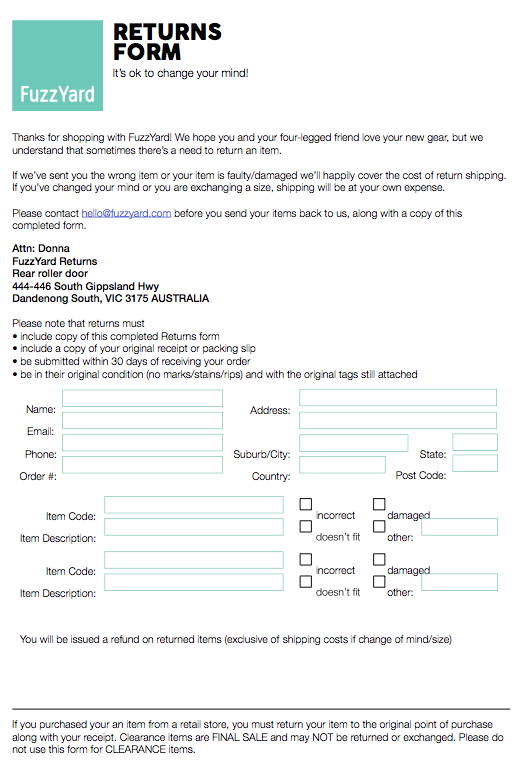 Simply download & fill out a copy of our Returns Form, include this in your parcel along with a copy of your invoice. This all depends how you choose to send your returns to us! Returns that are sent back via standard post can take 2-7 business whilst express can take as little as 1 day to reach our warehouse. Once received, your request will be processed and refunded within 3-5 business days. Please note that your financial institution may need 3-5 days to clear the funds back into your account. Keep an eye out for email notifications - well keep you updated along the way! Where will I see my refund? For refunds, we can only process them back to your original payment method, so keep an eye out for email notifications - well keep you updated along the way! Unfortunately, we can't do exchanges. Due to system limitations, we can only offer refunds. If you purchase an incorrect product, you will need to go through our Refund process and purchase a new product afterwards. I have received the wrong product. What do I do? If you have received an incorrect item, please email our customer service team along with your order number, description of what you have incorrectly received along with photos. A customer service team member will be in touch with you regarding the Returns Process. Please do not send any products back without contacting us. The product I ordered is faulty or damaged. What do I do? If the item you have purchased is faulty please email our customer service team and include your order number with a photo and description of the faulty/damaged product. A customer service team member will then be in touch with you regarding the Returns process. Please do not send faulty product back without contacting us. Will I need to cover the cost of postage back to In Vogue Pets for my return order? We’ll happily cover the cost of return postage only if you have received the incorrect product or if your product has arrived damaged or faulty. Unfortunately, we can’t cover the cost of shipping for change of mind or size. We also recommend to get either a postal receipt or a tracking number with your parcel as goods are the customer’s responsibility until they are receipted back by In Vogue Pets and all shipping costs are at the expense of the customer. *Our returns policy can be changed without notice.